I received Cubetto to review for Academics' Choice Awards. 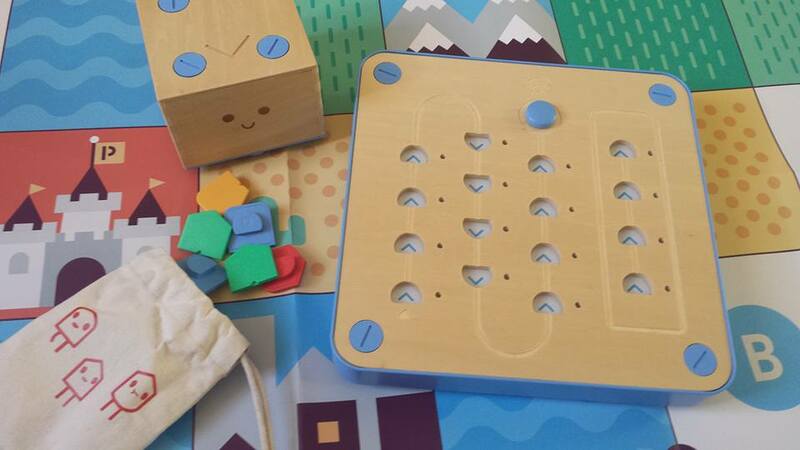 Cubetto is made by Primo Toys and was originally a Kickstarter project. 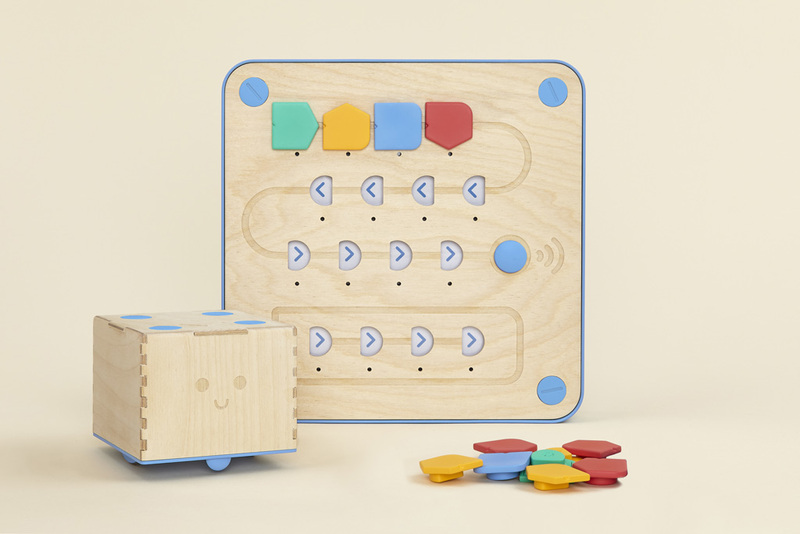 Cubetto is a Montessori approved, hands-on coding toy for children ages 3 to 6. It comes with a Cubetto wooden robot, a board, 16 blocks (four of each: left, right, straight, and function), a map, and a storybook. My 5 and 6 year old LOVE Cubetto! They even had to bring it to grandma's house to teach her how to use it. They have also enjoyed teaching their younger cousins how to use it too. It's simple to use and easy to set up, even for a 3 year old. All you have to do is spread out the map, pour out the blocks from their fabric bag, turn on Cubetto and the board, and you're good to go! When we first began using Cubetto, I read the instructions out loud, and explained what each block did when it was placed in the board. We turned on Cubetto and I pointed out each of the little robots movements and how they mirrored the blocks on the board. After a few test runs, I opened up the storybook and showed them how you can take Cubetto on a fun trip around his map. The kids were thrilled with the storytelling aspect of it. Now when the kids are playing together, they will take turns, one filling the queue and the other telling a story as Cubetto moves from square to square on his map. They call him "Cubie" and take him on lots of silly adventures. Whenever he wanders off the map, the kids laugh and say he can't help exploring the unknown. One thing I would love to become available for Cubetto owners who weren't part of the Kickstarter or who did not order Cubetto with the Adventure Pack, is to sell the maps separately. In addition to the basic map, which is the one we have, there is also an aquatic/pirate, Ancient Egypt, space, and city map. They could line up the maps and take Cubetto on one huge, epic adventure, or they could use them on their own and use them for storytelling activities. I love that in addition to teaching coding, Cubetto also encourages kids to be creative storytellers. 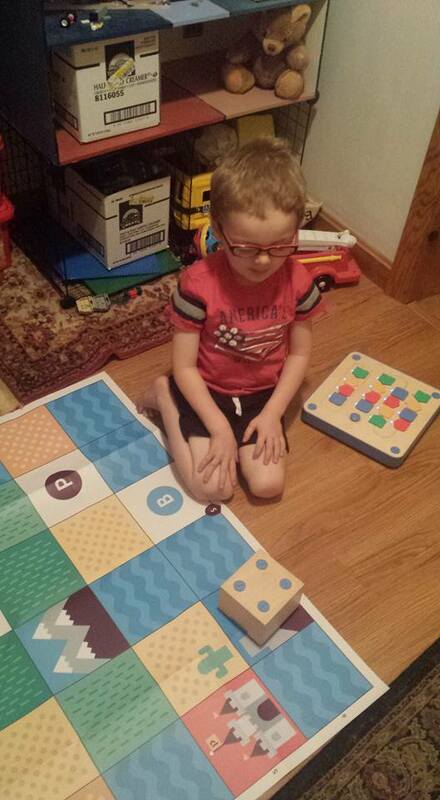 And when played with more than one child, Cubetto can let kids practice patience and sharing. Children will love playing with Cubetto. It's a cute little wooden robot that rolls around on little wheels. 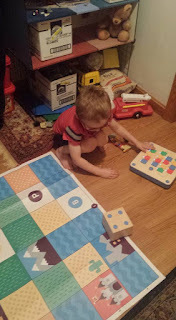 My son, who is fascinated with electronics, and was 4 when he began playing with Cubetto, really took an interest in figuring out how Cubetto worked. We haven't used Cubetto for any homeschool STEM lessons, but he plays with it daily and that's a lesson in itself. So how does Cubetto teach children beginner coding? It uses the blocks and interface board. There are four simple commands, which tells Cubetto where to go. There are three lines in the queue (main sequence) and a line for the function command. There can be a maximum of 12 commands in the queue and 4 commands in the function square (which is a subroutine). My son discovered on his own that he could create a loop of actions by adding a function block to the function queue, which would reset and start over again. The blue button at the top is the Go button, that tells Cubetto when to start his adventure. The blocks are color coded and shaped, so children can easily tell them apart. Green for forward, yellow is left at 90 degrees, red is right at 90 degrees, and blue is the function block. The map is designed so each square is a single movement for Cubetto. Children can plan his adventure starting on any square on the map. They can let his destination be random or they can plan out a specific journey. If Cubetto can't make it there in one go, he'll stop at the end of his set and wait for new instructions. My daughter likes to tell stories as he moves around. I write it down for her in her journal and she draws pictures later, illustrating Cubetto's adventure. I would highly recommend Cubetto for parents and teachers of preschoolers and kindergartners. It works well with one child, or a small group of children. Children in a classroom could take turns using Cubetto in small groups. At home, older children can help their younger siblings learn how to use Cubetto. It's a fun toy to learn coding skills at a young age. All children can benefit from STEM skills.